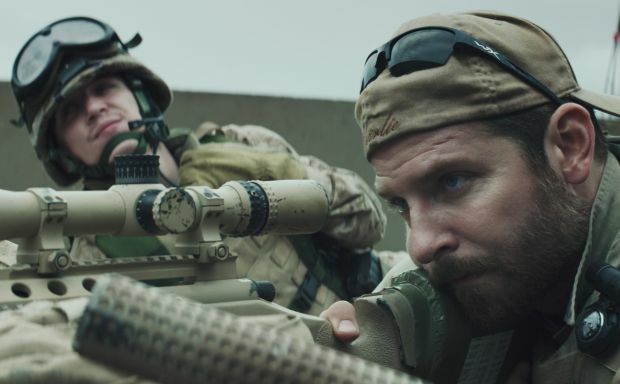 NEW YORK (CNS) — For those seeking an insight into an individual veteran’s perspective on the Iraq War, director Clint Eastwood’s sober drama “American Sniper” (Warner Bros.) — which stars Bradley Cooper as real-life Navy SEAL Chris Kyle — will likely hit home. Yet moviegoers in search of a bigger-picture moral assessment of that conflict, or of armed clashes in general, may come away disappointed. Drawing on Kyle’s 2012 memoir (written with Scott McEwen and Jim DeFelice), Eastwood and screenwriter Jason Hall trace the expert sharpshooter’s rise to celebrity status among his comrades. They also track his emergence as a prime target for enemy insurgents who eventually put a price on the Texas native’s head. Determined to safeguard his fellow fighters — who dub him “the Legend” in recognition of his life-preserving prowess — Kyle insists on returning to combat through four grueling tours of duty. But his exposure to the moral and emotional pressures of urban warfare predictably exacts a psychological toll and places a strain on his relationship with his loving wife, Taya (Sienna Miller). Scenes set during Kyle’s childhood show his forceful dad instilling the belief that people can be divided into three basic categories: predatory wolves, vulnerable sheep and protective sheepdogs. From the adult Kyle’s point of view, it’s enough to know that there are villains on the loose in Iraq — and innocent victims potentially at their mercy — for his chivalrous course of conduct as an aspiring member of the third grouping to become apparent. While Eastwood successfully conveys Kyle’s personal heroism, his film avoids engaging the larger issue of whether the geopolitical cause to which Kyle repeatedly and resolutely lent his skills was an ethically valid one. In purely cinematic terms, moreover, the picture alternates between effectively displaying the consequences of Kyle’s scarring battlefield experiences and weakly relying on dialogue that can only hint at these same wounding repercussions. Taken on its own terms and considered as a whole, however, Eastwood’s movie reliably escorts viewers through both the agonizing instantaneous dilemmas and the longer-term complexities that confronted the courageous warrior on whom its action centers. The film contains stylized violence with some gore, a scene of torture, a premarital situation, some sexual humor and references, several uses of profanity and constant rough and crude language. The Catholic News Service classification is A-III — adults. The Motion Picture Association of America rating is R — restricted. Under 17 requires accompanying parent or adult guardian. Thank God for men with the courage and skill of Chris Kyle, the sniper. The movie shows his commitment to take out “the bad guys” and a sniper, unless air craft bombs, take out only the bad guys. In the movie, Chris is shown repeatedly with his Bible. A great movie and bravo to Clint Eastwood for portraying it correctly.